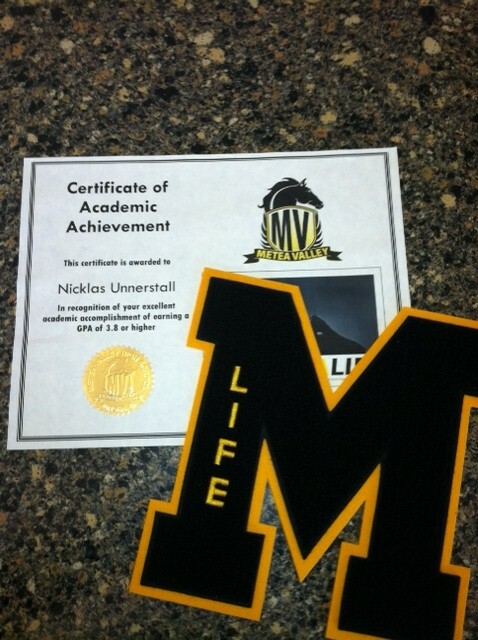 In a few months, Nick will be walking across the stage to accept his high school diploma. We are not doing the typical things you do for the senior year. No need to reserve the tux or limo for prom. It’s not in the cards to visit any college campuses. And ten bucks says that the hat and tassel are going Frisbee air born as he crosses the stage at the NIU Convocation Center. 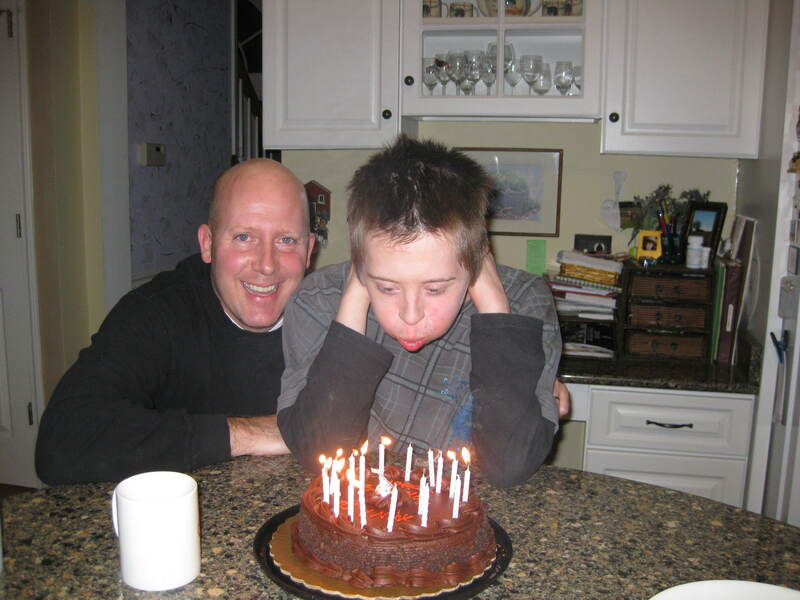 Question is….. What does someone who has Down syndrome and autism resulting in severe cognitive and speech delays plan to do after high school? Once the “certificate of completion” is put on the shelf, we move into the next phase for Nick. The program is affiliated with the school district and called STEPS (Supported Training Experiences Post-Secondary). 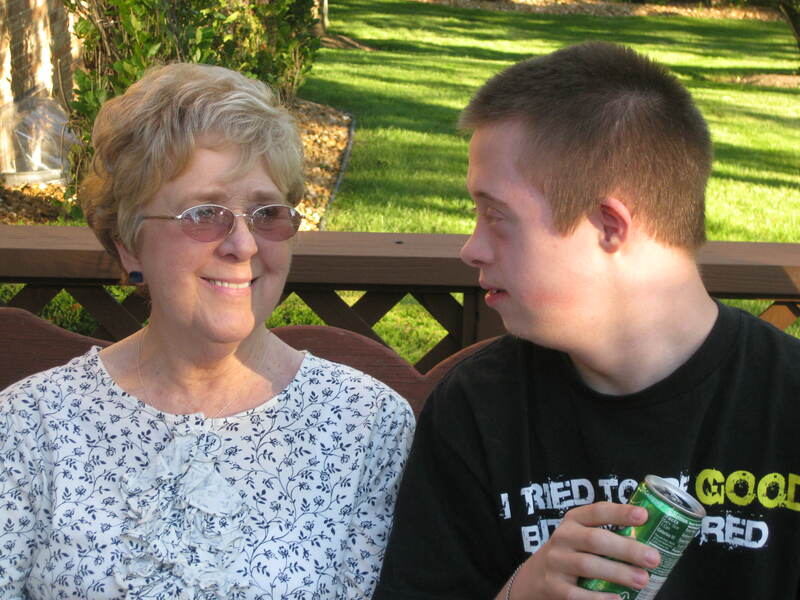 Under the *IDEA law, a student with special needs may continue with high school or enter a transition program up until they turn 22 years old. The decision for placement is based on the child’s individual needs. Students with developmental delays may benefit more by having extra time to work on vocational, social/leisure, self-help skills along with their educational training. Many students who are higher functioning academically may be able to take college courses and have paid jobs. Last week we had the opportunity to visit the campus and get a closer look at the STEPS program. Al attended the first session. I followed up with Nick since we had to do a team tag with him and went to the second session geared for graduating seniors. While we waited for the second meeting, Nick and I took a tour of the building. By the way, all but one fire alarm is not covered but I bet it will be soon.🙂 He loved the campus, especially the sensory room. 1. What does Nick need to connect to the next level of adult life? 3. 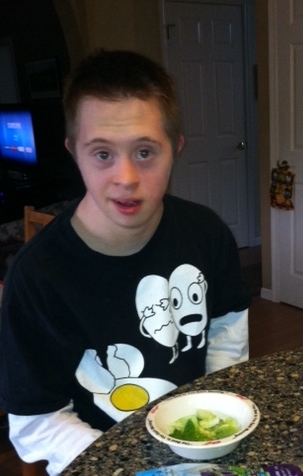 Will Nick participate in a vocational and/or life skills day training program or enroll in a degree-seeking program? 4. Upon completion of public school what arrangements need to be made for independent living (community activities, living arrangements, sports and recreation, transportation, healthcare, financial support, emotional support)? How do we plan to access them? What supports are needed? So the task at hand is to figure out what Nick is good at and also what he likes to do. From there we work with the team to build a program with this in mind. 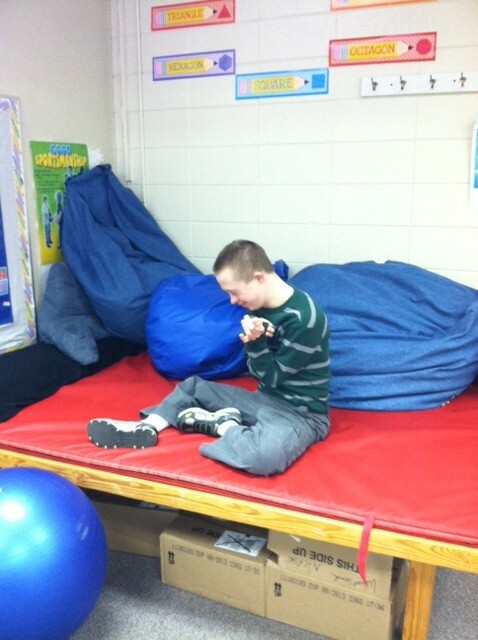 The three main areas are educational and vocational training along with building his independent living skills. Each classroom has a function in the building. There is a kitchen to work on cooking skills. One classroom is built around vocational skills (with can crushers, shredders, work bins, and the campus micro-enterprise that includes making note cards and beaded jewelry.) A current STEPS student has her own business making beaded jewelry. Check it out at http://www.specialsparkle.com! Another room is for fitness and recreation filled with music, a Wii gaming system and comfy couches. There is also a sensory room along with a few others that are used for academics and working on self-help skills (like time management, money handling, riding public transportation, etc…) Again, the program is centered on the individual their goals and getting them to that place by the exit date which is the day before their 22nd birthday. I should add here that some students exit earlier if they reach a place where they are working independently at a paid job. So Nick will have new jobs next fall and opportunities to do community service along with social functions (clubs, dances, bowling, etc…) It looks much like what he is already doing in high school but more laid back (no school bells, the students manage their own schedules.) 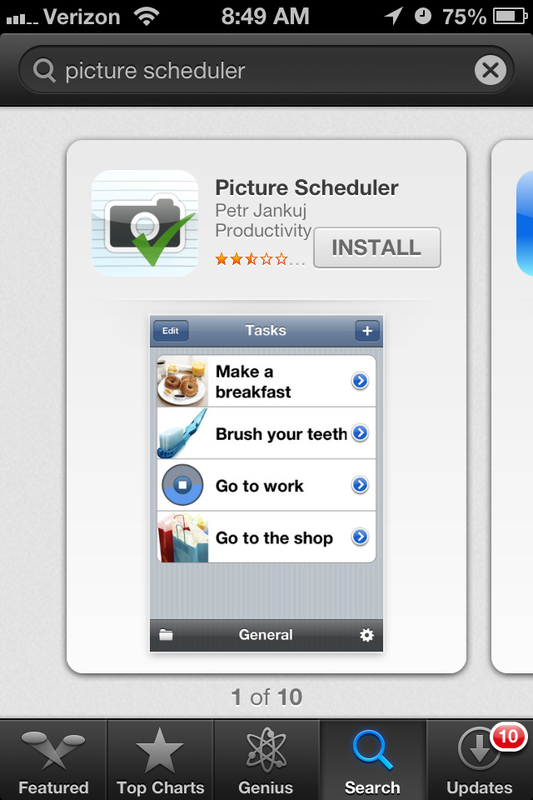 Looks like I will need to get an app for that. 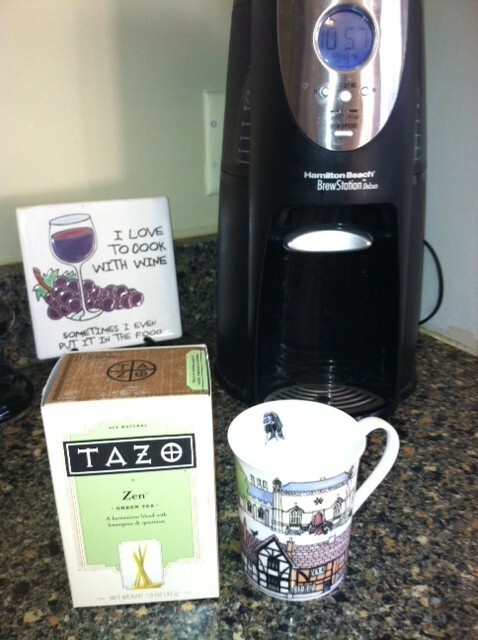 That’s what is in my noggin this week, stay tuned maybe I’ll have some answers by mid-March! *From Wikipedia: The Individuals with Disabilities Education Act (IDEA) is a United States federal law that governs how states and public agencies provide early intervention, special education, and related services to children with disabilities. It addresses the educational needs of children with disabilities from birth to age 18 or 21 in cases that involve 14 specified categories of disability. In defining the purpose of special education, IDEA 2004 clarifies Congress’ intended outcome for each child with a disability: students must be provided a Free Appropriate Public Education (FAPE) that prepares them for further education, employment and independent living. Students with disabilities should be prepared for further education, employment, and independent living. 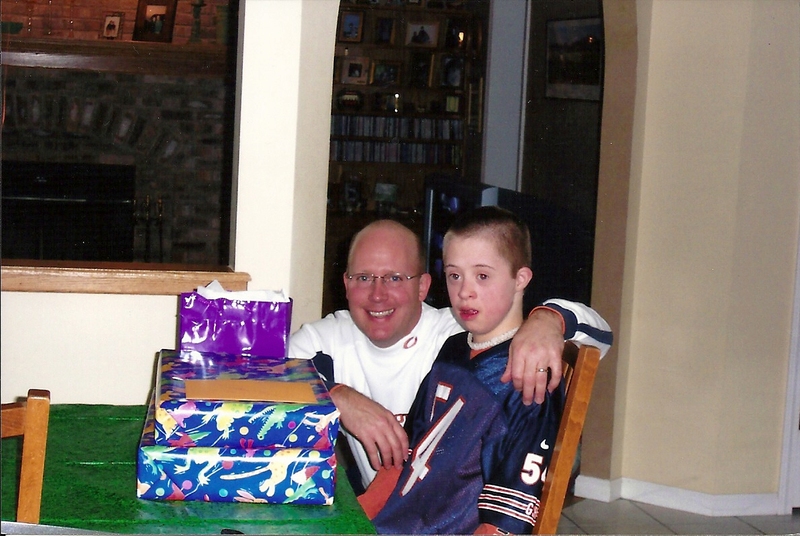 Last week over Valentine’s Day I got to thinking about the ways in which Nick shows love, affection and compassion. 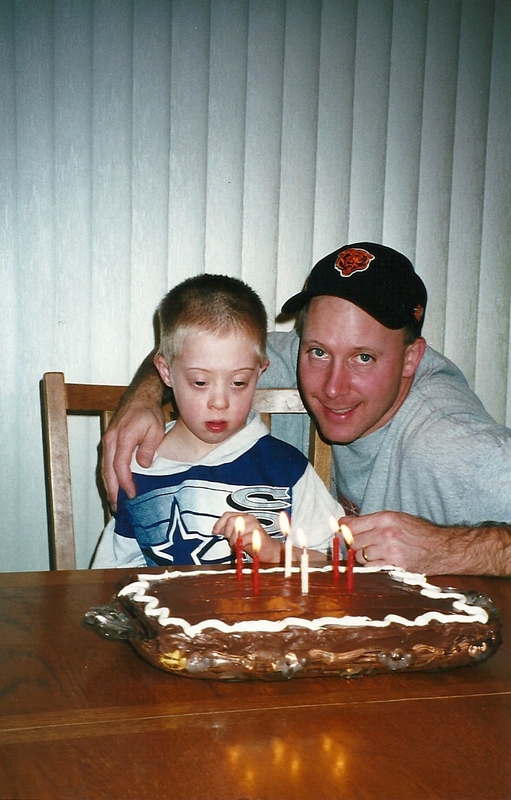 How can a person having both Down syndrome and autism do so without being able to use many words? I threw the question out there to those who are closest to him. I found some interesting responses along with a few similar, underlying themes about love, Nick style. What is love? According to Wikipedia, Love is an emotion of a strong affection and personal attachment. Love is also said to be a virtue representing all of human kindness, compassion, and affection —”the unselfish loyal and benevolent concern for the good of another”. Love may describe compassionate and affectionate actions towards other humans, one’s self or animals. 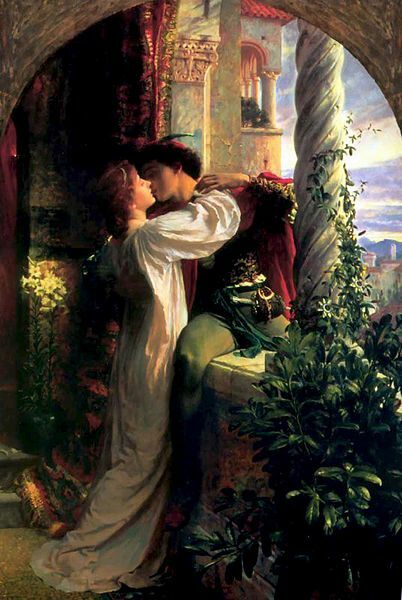 The famous balcony scene from Romeo and Juliet. 1884 painting by Frank Bernard Dicksee. Courtesy of Wikipedia.…. As Nick’s mom, I feel his love freely with the kisses he gives me. They are cute little pecks on my cheek or sometimes on my shoulder. He gives those to his Dad and brother and even the cat sometimes. I see it in his eyes that gleam when he is happy. I sense it when he offers up his neck for me to blow him some raspberries. I know it when I come home from a long evening out and the icon strip has my picture on it. I see this time again with the picture icons. He will hand me one with his Dad, grandparents, aunts, uncles, brother, teachers and former respite workers like Jess and Mr. T. I know he misses them and wants to see them. The day after my father passed away, he handed me the picture of my Dad on a gloomy, snowy morning in October. I held it and gave him a hug. 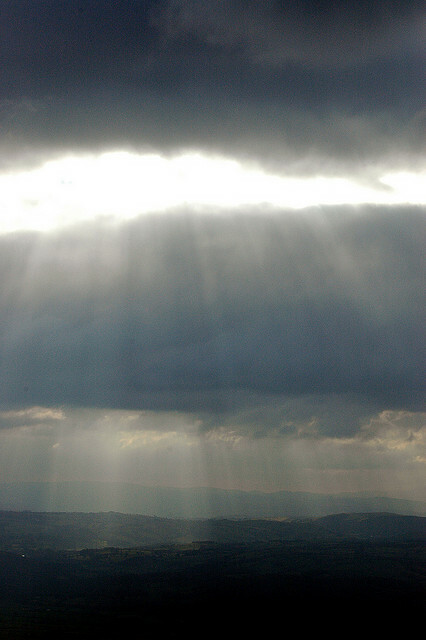 As I looked out the window fighting back tears the sun’s rays began to peek out behind the clouds. “I think Nick has many ways in which he shows his feelings of love, affection, and compassion. Physically, he does a great job by sharing elbows, rubbing noses, high fives, etc. 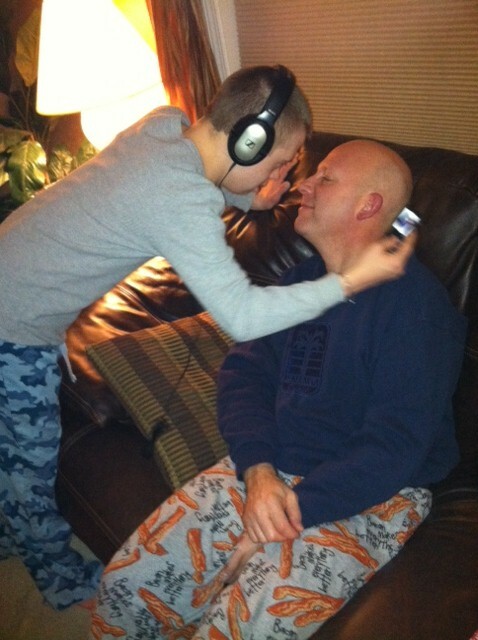 I think that Nick is very affectionate with adults with whom he has built strong relationships. I also feel like Nick’s sense of humor is something that he shares with those he is close to. I’ve also seen Nick have a “crush” on another student this year. He often picks her when he has to take turns and often watches to see what is going on with her when we are in the classroom. When she becomes upset, Nick will quickly look to her and raise his voice in protest too. Now, I understand that Nick is not a fan of noise made by others, but his reaction to this student is unique. I’ve seen Nick’s compassion extend even farther to others. He is good at mimicking others emotions, and pointing out emotions (think about the sad egg t-shirt). He also has a genuine side of compassion. I have had staff tell me that Nick has cried after watching others cry. Sometimes it’s a touch on the cheek like with Grandma Babs, or rubbing elbows or noses. My brother and his daughter Courtney think the *Eskimo kisses are awesome! So, that is love, Nick style. Hope you enjoyed the unique perspectives. For more about Nick and his special relationships check out Blog #6~ The Nick Connection which is located in the May archives. That’s what is in my noggin this week. Until next Monday, peace, love and belly flashes! *Eskimo Kiss- According to Wikipedia…..
“In modern Western culture, an eskimo kiss is the act of pressing the tip of one’s nose against another’s. It is loosely based on a traditional Inuit greeting called a kunik. 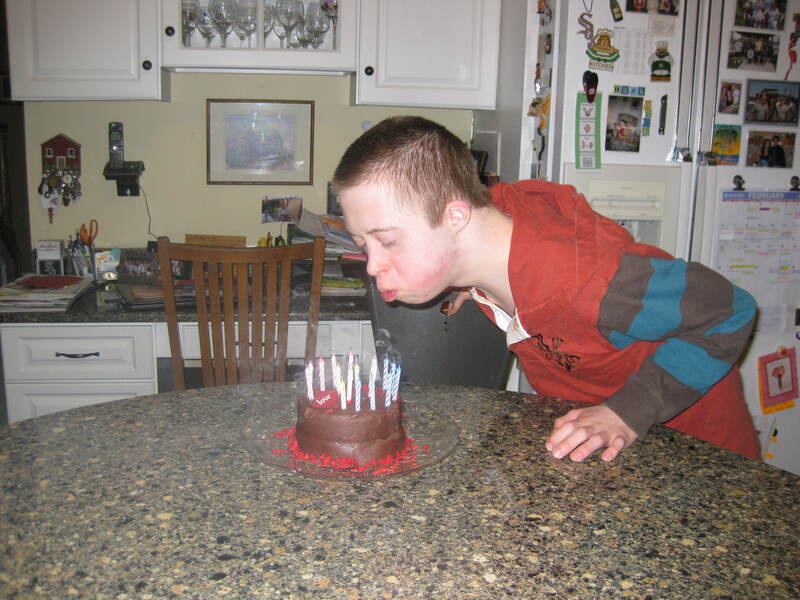 Here is a look at some of Nick’s birthday celebrations. What a journey it has been. 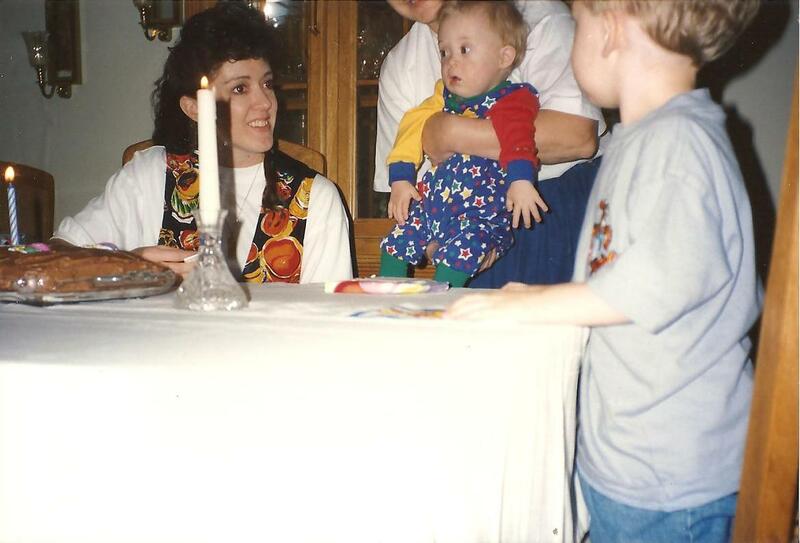 Nick’s first birthday was celebrated with my side of the family and with my friend, Sally’s family. 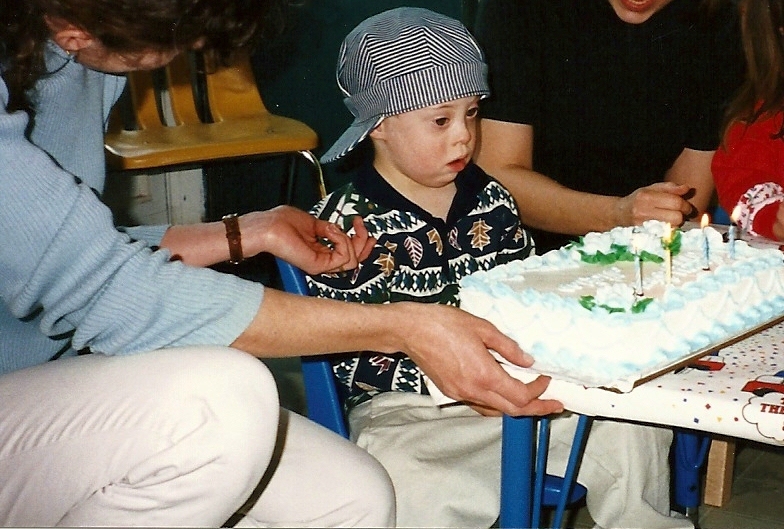 Nick has very low muscle tone and you can see that my mom had to hold him with support over the cake as he blew out the candles. At this point he was sitting up but far from being able to crawl very far much less pull up to stand. 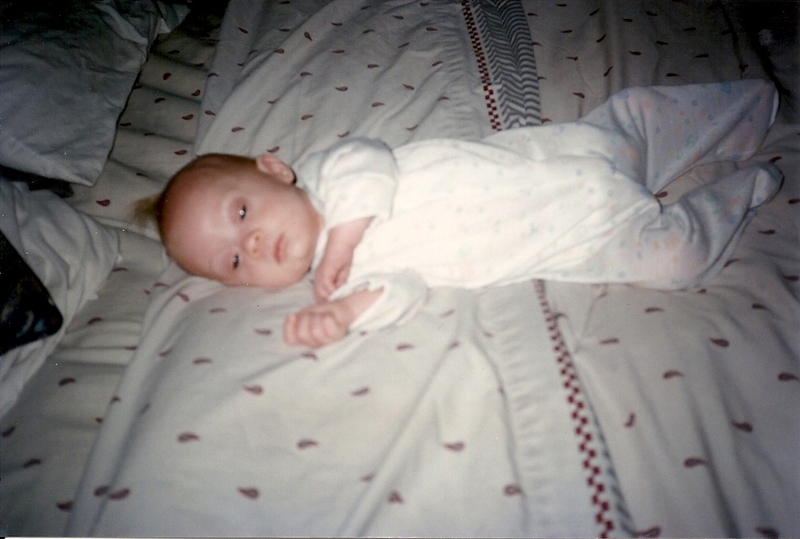 It wasn’t until Nick was 3 ½ until he was able to walk on his own. 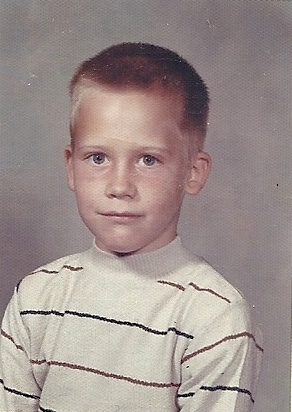 Here he is at the Arbor School in Houston celebrating his fourth birthday. We relocated to the East Bay area outside of San Francisco. Many of the celebrations were simple. This is a sad little cake. It’s pathetic as Hank would say. I am ashamed I made that. 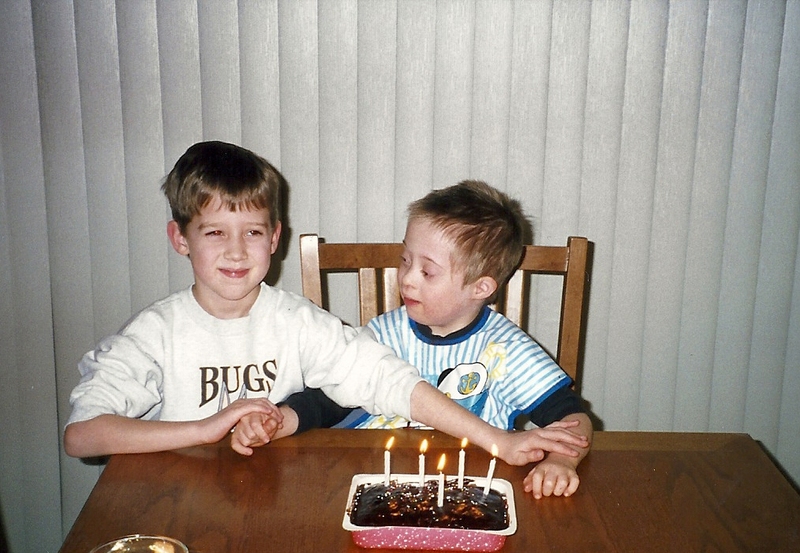 Hank holding his brother’s hands so he won’t flap them by his ears….. He is sooooooooo excited! He is going to town stimming those hands by his ears. Looking back I see it; a trait of autism. 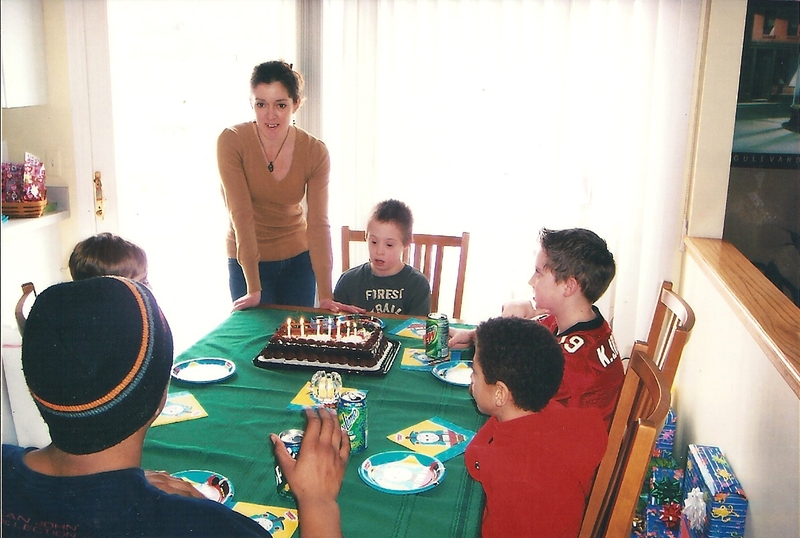 Here’s Al at age 6, sporting a short cut like Nick…..all together, aahhhh he’s so cute…..
We moved to the Midwest and Nick celebrated his 7th birthday in style with a legit cake and the party theme was Thomas the Tank Engine. 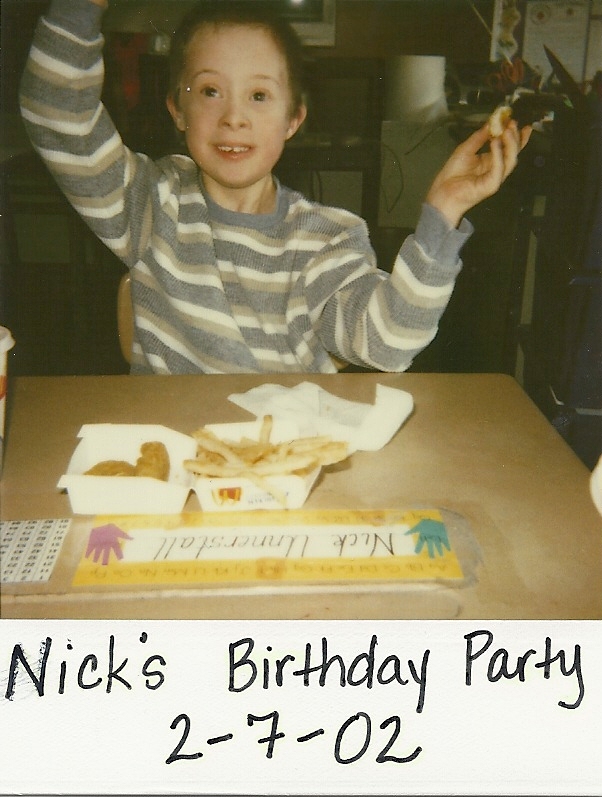 At school for his 8th birthday, Nick got a special lunch with a Happy Meal. 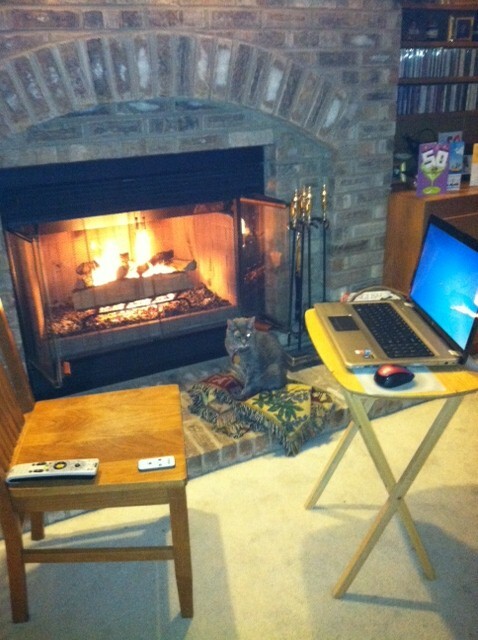 Looks like it is working….what a happy guy! 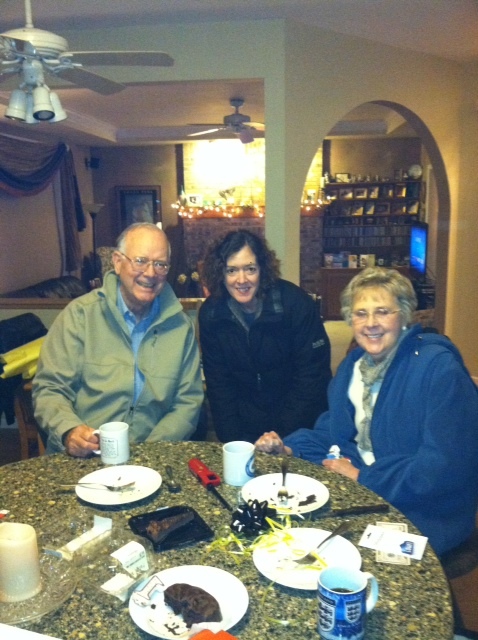 The following year the birthday boys celebrated together with Al’s folks Jim and Theresa on Super Bowl Sunday. Best part of the day was the opening kickoff that Devin Hester ran back for a touchdown. Unfortunately, Da Bears came up short. But it looks like the birthday boys got some nice presents. Nick is really growing and rocking that Brian Urlacher jersey! 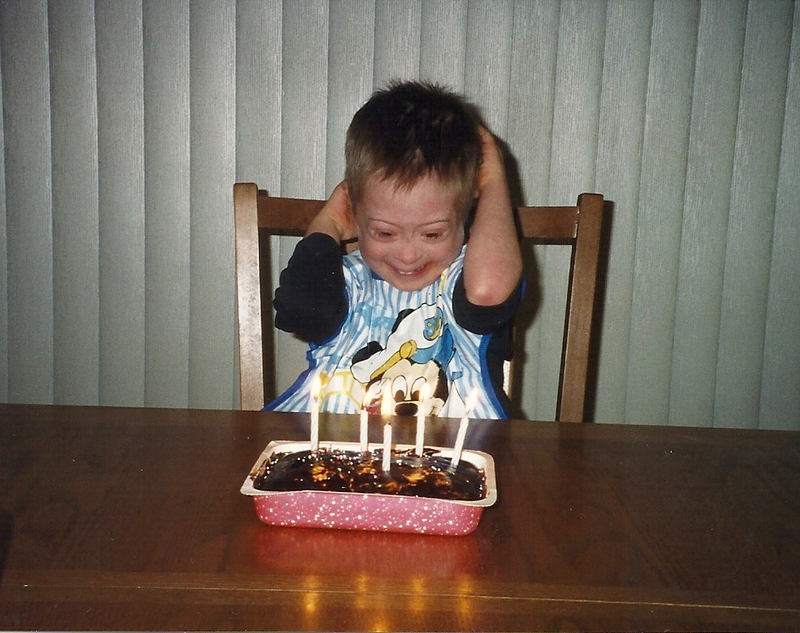 Nick’s got to get more lung power for his 17th, whew…..
Big breath now you have 18 candles to blow out..Big guy’s got this! 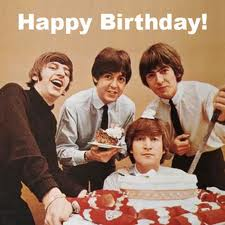 I hope you enjoyed this little taste of the boy’s birthday celebrations. Common theme seems to be chocolate cake in all shapes and sizes. What a contrast from the low tone baby 19 years ago to present day. My good friend April G. always says, “Funny thing if you feed and give them drink, they will grow.” Nick has done that in his own way and pace. Not always in the time frame I had invisioned for him. But he did, and I couldn’t be more proud. That’s what is in my noggin this week. Happy birthday boys and cheers to many more.🙂 Have a great week everyone and may your cake be full of candles this year and for many more to come!